For some reason we know several families of Norwegian descent. Several year ago, we were visiting one of those families in Seattle and we happened to be there during the birthday of one of their little boys. For breakfast he requested Norwegian Pancakes. I’d never heard of them before, but when I tasted that first bite, I was hooked. I’m more of a waffle person than a pancake person, because my stomach tends to feel like I ate a lead balloon after I’ve eaten American pancakes. 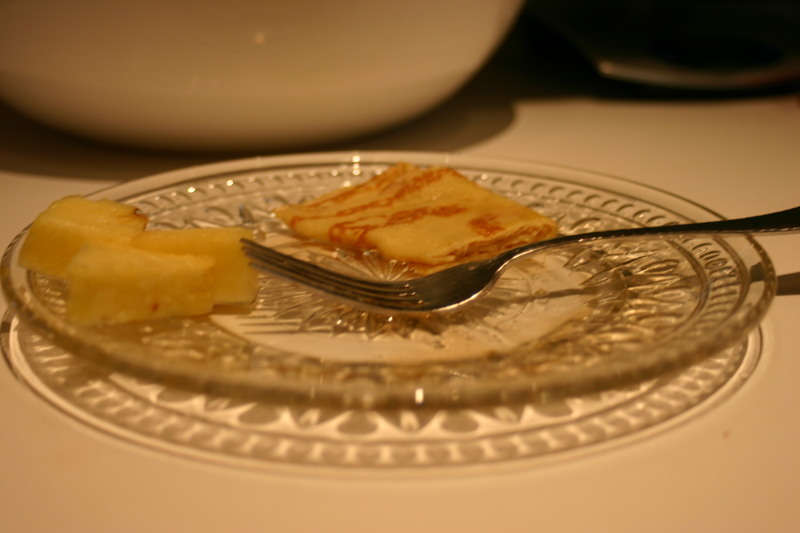 Norwegian pancakes, while filling, are thin and delicate, and not so dense and heavy. I’ve become a fan of these, and make them a lot when we have company. In fact, another family of Norwegian heritage stayed with us once to celebrate the New Year, and they brought along a real Norwegian. She was an exchange student living with them for the school year. Being that there was a true Norwegian in the house, I thought it only appropriate to serve these for breakfast. We wondered whether this recipe is just an Americanized version, so we asked her if this was what she was used to at home. Her response? So I’m fairly certain this recipe is authentic. And it’s pretty delicious too! Enjoy it! 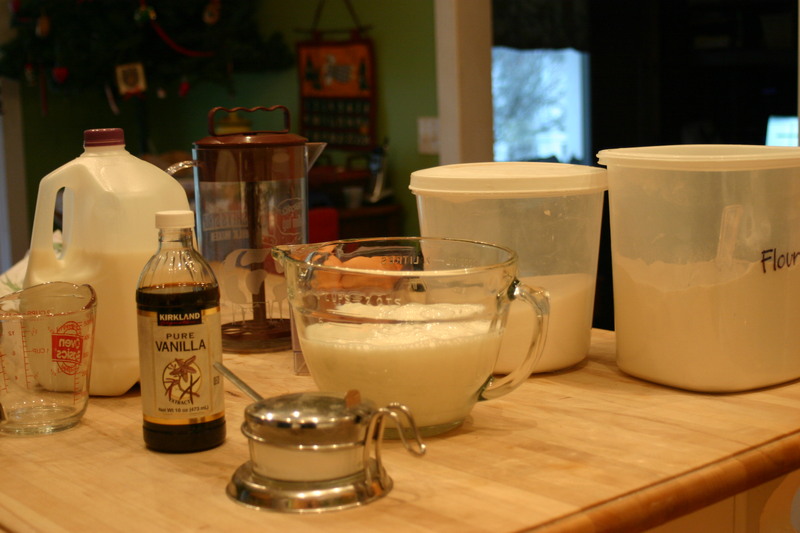 In a large bowl whisk together eggs, milk, sugar, and 2 T butter. In a separate bowl , mix together flour, salt, and sugar. 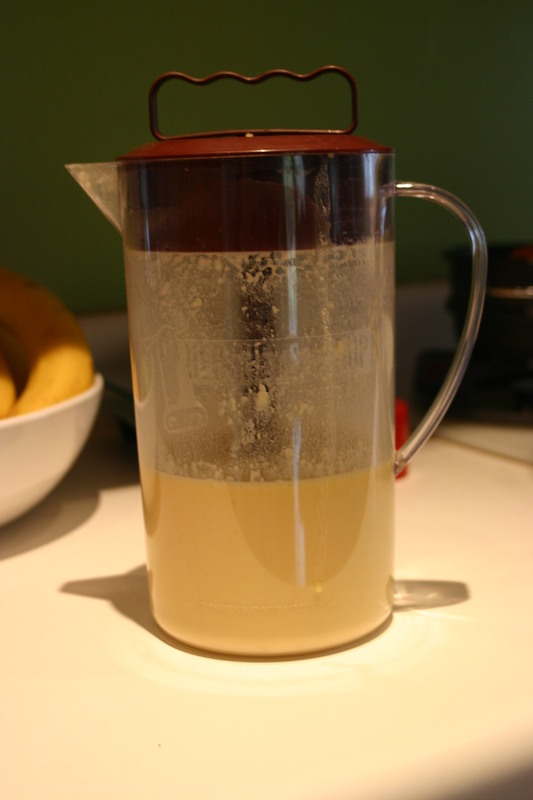 Slowly pour liquid ingredients into the dry, blending until completely mixed, and there are no lumps. It helps if one of your mixing bowl has a pour spout, so you can easily and cleanly pour the mixture – which will be thin and liquid-y – directly into a hot skillet. I use this handy-dandy Hershey’s Syrup Chocolate Milk Mixer that’s just perfect for mixing and pouring. I sent in some cereal box tops once upon a time when my children were little and it was a special treat for them to make their own chocolate milk with the “plunger.” Now I hardly – well, never actually – use it for chocolate milk; it’s only job is to be the Norwegian pancake maker. 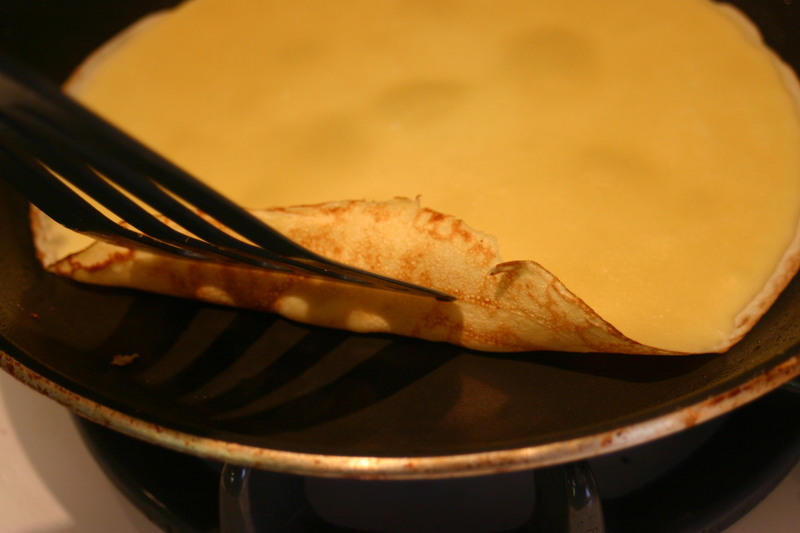 These pancakes are basically just sweet crepes (although Norwegian Pancakes sound so much more exotic) so you will need to have some sort of omelet pan to make them in. You could use a griddle, but because they are so thin, it really does help to have that graduated side to slide them off enough to flip. To begin, heat your omelet pan to medium – medium high heat. If you don’t have a non-stick pan, spray a little bit of cooking spray to coat the bottom and sides. 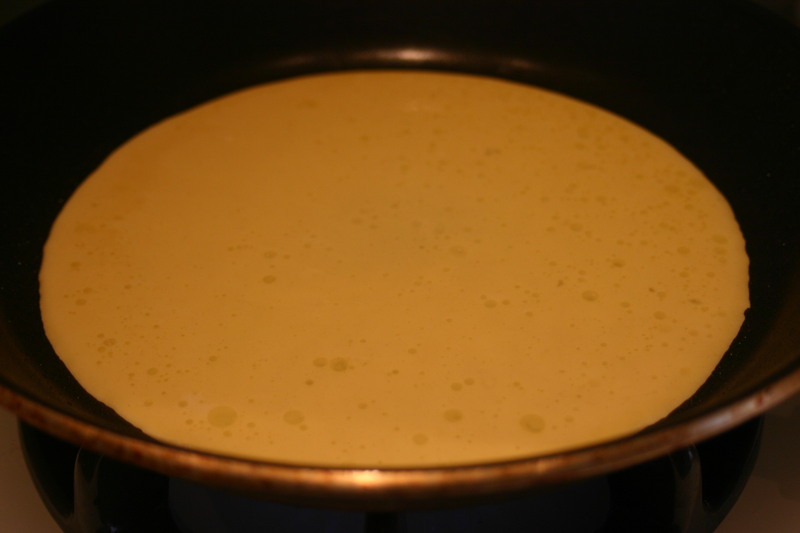 Even if you do have a non-stick pan, I spray a bit on regardless so that the pancake will slide a bit easier. 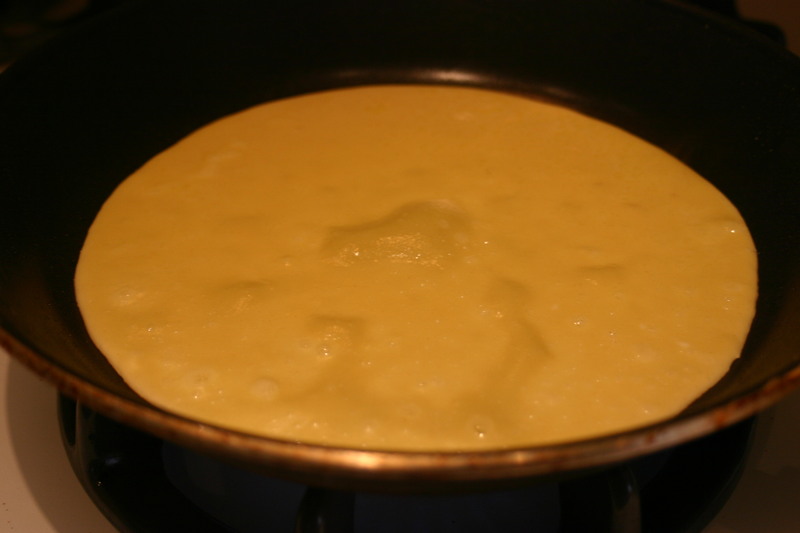 Pour a scant amount of the batter into the pan. I’m guessing you need to use somewhere between 1/4 C to 1/2 C of the batter, but it will depend upon the size of your skillet. I’m using a 10″ pan and poured in just under 1/2 C of batter. You just need to lightly coat the bottom with the batter. The amount you pour in is very similar to making an omelet. Let the pancake sit a moment or two. When it begins to bubble in the middle, you’ll want to check around the edges to see if it’s beginning to brown on the bottom. If it is, wait another 10 to 15-ish seconds so that the middle will be done enough to slide to one edge of the pan. 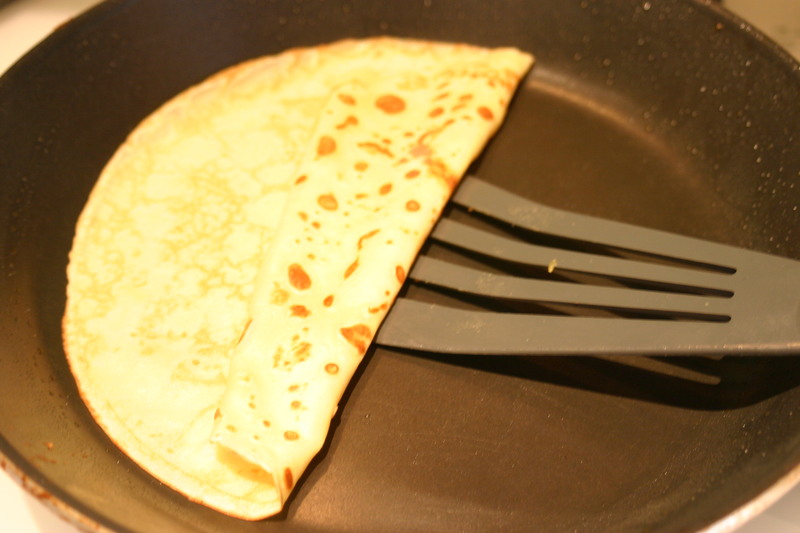 If it’s not done, because these are so thin and delicate, you’ll likely tear the pancake in the middle like I did here! If it is brown, and cooked enough in the center, gently slide the pancake to one edge of the pan, and use your spatula to flip it over. By the way, I LOVE these Matfer spatulas. They’re safe for non-stick pans and are angled in order to easily get anything flipped or even just get cookies off the cookie sheet. 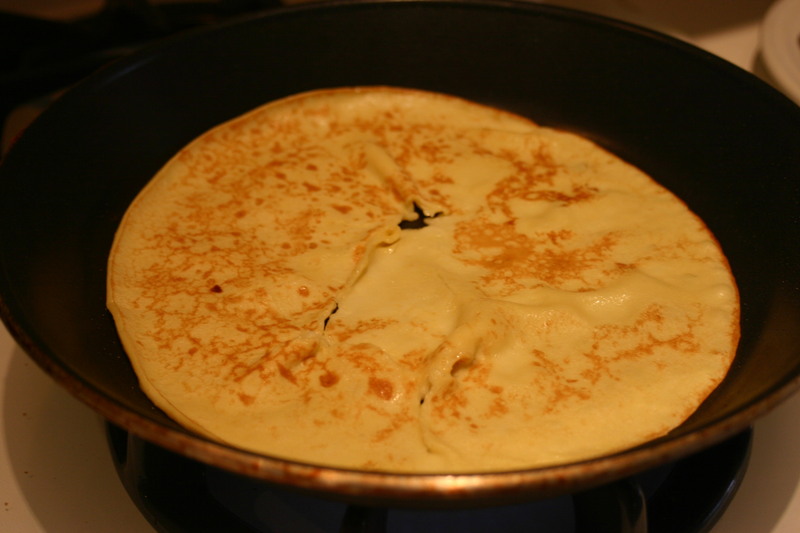 The 2nd side of the pancake only needs a short time to brown. At this point, I will lightly brush some of the 2 T of remaining melted butter on top. After the butter is brushed on, use your spatula and begin rolling the pancake into a tube shape, and slide it directly onto your serving plate. You can fill the pancake before it’s rolled (traditionally with Ligonberry jam), but it’s excellent as is, with maybe a hint of powdered sugar or maple syrup. *Cook’s note: If you do double the recipe, or want to make extras for a brunch, simply line a cookie sheet with parchment paper, roll the pancakes as you make them, then lay them next to each other on the parchment, placing the cookie sheet in the oven on warm. You can fit about 16-20 of them on a large cookie sheet. Yep, these basically are crepes. I’m sure without the vanilla and sugar, you could do something savory. 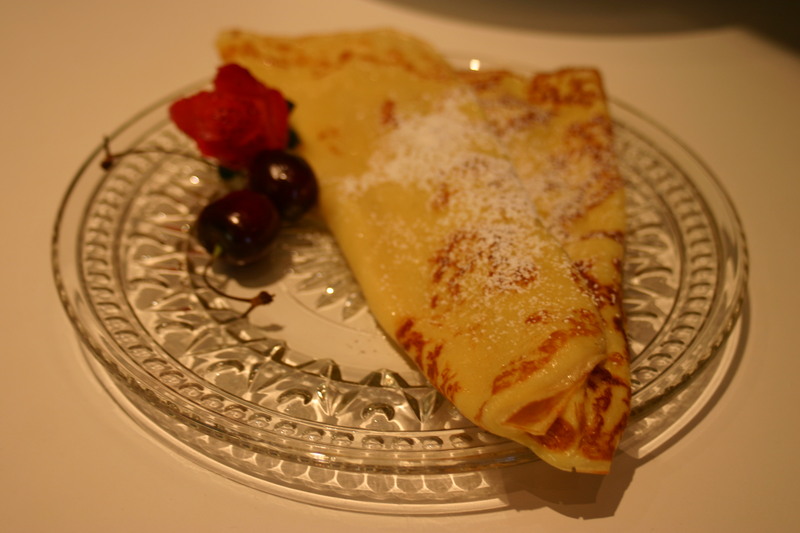 Still, this is the recipe our Norwegian friends gave us, so I’ll just go with the whole pancake thing! 😉 Btw, your website is beautiful, and I can’t wait to try those cottage cheese cookies; what a unique idea! I like it! I will surprise my husband with Norwegian pancakes for breakfast this weekend. Thank you for sharing. I hope cookies will work out well. I like to roll them pretty thick so they come out super soft. These look awesome. I love crepes, and they look very similar. Wow – sorry this reply is so late, but yes, they are a lot like crepes. If you left the sugar and vanilla out, that’s exactly what they’d be. And btw, I loved your post on big butts! I think we must be similar in our body type and how we treat that body food & exercise-wise. (I’m sure there’s a better way to express that grammatically, but for the life of me, I can’t think of it now…) I found myself shaking my head in agreement to what your wrote quite often – great post! Hahahahaha. You read that post eh? Yea, the movie, “My Life in Ruins” inspired that post. I’m glad you could relate. That means I’m not the only one then.